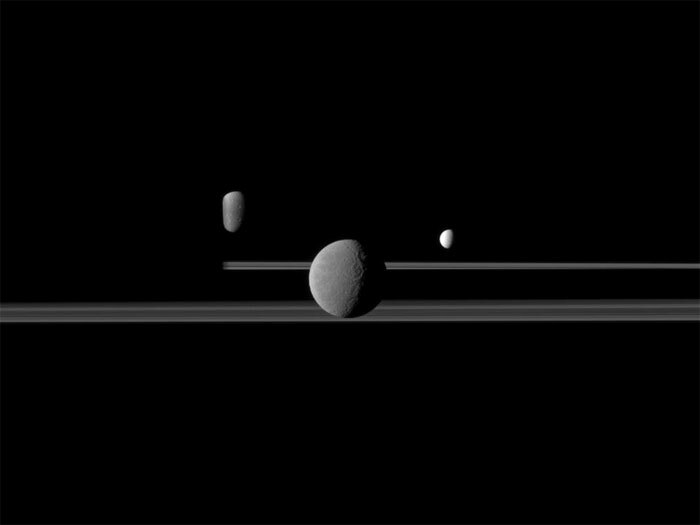 The Cassini spacecraft observes three of Saturn's moons set against the darkened night side of the planet. Saturn is present on the left this image but is too dark to see. Rhea (1,528 kilometers, or 949 miles across) is closest to Cassini here and appears largest at the center of the image. Enceladus (504 kilometers, or 313 miles across) is to the right of Rhea. Dione (1,123 kilometers, or 698 miles across) is to the left of Rhea, partly obscured by Saturn. The image was taken in visible red light with the Cassini spacecraft narrow-angle camera on April 25, 2011. The view was obtained at a distance of approximately 2.2 million kilometers (1.4 million miles) from Rhea and at a Sun-Rhea-spacecraft, or phase, angle of 67 degrees. Image scale is 13 kilometers (8 miles) per pixel on Rhea. The view was obtained at a distance of approximately 3 million kilometers (1.9 million miles) from Enceladus and at a phase angle of 67 degrees. Image scale is 18 kilometers (11 miles) per pixel on Enceladus. The view was obtained at a distance of approximately 3.1 million kilometers (1.9 million miles) from Dione and at a phase angle of 67 degrees. Image scale is 19 kilometers (12 miles) per pixel on Dione. Though they are tinted on the surface from recent “pollution,” these bodies date back more than 4 billion years. They are from around the time that the planetary bodies in our neighborhood began to form out of the protoplanetary nebula, the cloud of material still orbiting the sun after its ignition as a star. The paper, led by Gianrico Filacchione, a Cassini participating scientist at Italy's National Institute for Astrophysics, Rome, has just been published online by the Astrophysical Journal. Data from Cassini's visual and infrared mapping spectrometer (VIMS) have revealed how water ice and also colors -- which are the signs of non-water and organic materials --are distributed throughout the Saturnian system. The spectrometer’s data in the visible part of the light spectrum show that coloring on the rings and moons generally is only skin-deep. Using its infrared range, VIMS also detected abundant water ice – too much to have been deposited by comets or other recent means. So the authors deduce that the water ices must have formed around the time of the birth of the solar system, because Saturn orbits the sun beyond the so-called "snow line." Out beyond the snow line, in the outer solar system where Saturn resides, the environment is conducive to preserving water ice, like a deep freezer. Inside the solar system's "snow line," the environment is much closer to the sun's warm glow, and ices and other volatiles dissipate more easily. A rain of meteoroids from outside the system appears to have turned some parts of the main ring system – notably the part of the main rings known as the B ring -- a subtle reddish hue. Scientists think the reddish color could be oxidized iron -- rust -- or polycyclic aromatic hydrocarbons, which could be progenitors of more complex organic molecules. The cause of the extreme brightness dichotomy on Iapetus is likely to be thermal segregation of water ice on a global scale. Thermal effects are usually expected to act latitudinally. That is, polar areas are colder than equatorial terrain in most cases due to the more oblique angle of the solar irradiation. Therefore, an additional process is required to explain the longitudinal difference as well. In one model, dark, reddish dust coming in from space and preferentially deposited on the leading side forms a small, but crucial difference between the leading and trailing hemispheres, which is sufficient to allow the thermal effect to evaporate the water ice on the leading side completely, but only marginally on the trailing side. 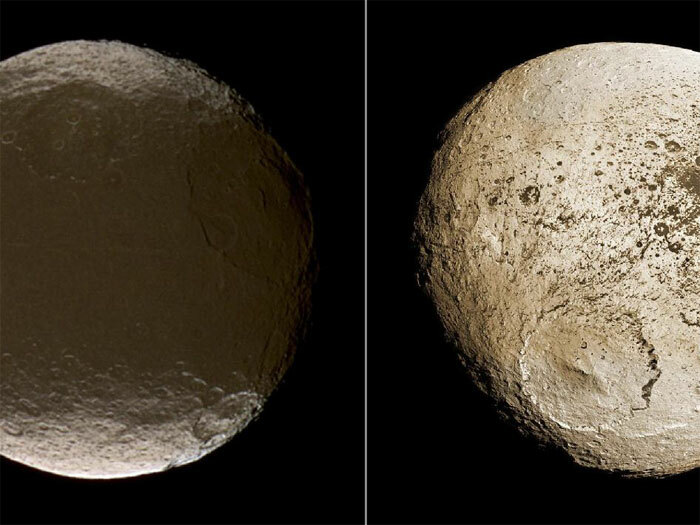 See Color Dichotomy on Iapetus to learn more. Iapetus' extremely slow rotation rate (1,904 hours), its distance from the sun, its relatively small size and surface gravity, and its outer position within the regular satellite system of Saturn are also crucial contributing conditions for this mechanism to work as observed. The right-hand panel, released previously as The Other Side of Iapetus, shows a mosaic of 60 different images, obtained on September 10, 2007. The effects of the small moon Prometheus loom large on two of Saturn's rings in this image taken a short time before Saturn's August 2009 equinox. A long, thin shadow cast by the moon stretches across the A ring on the right. 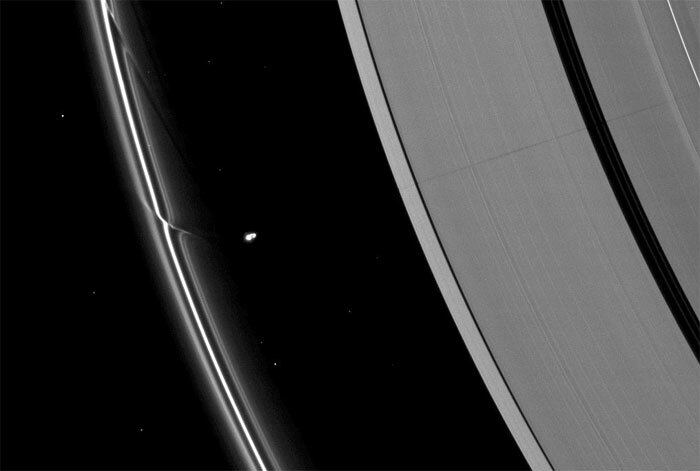 The gravity of potato-shaped Prometheus (86 kilometers, or 53 miles across) periodically creates streamer-channels in the F ring, and the moon's handiwork can seen be on the left of the image. The novel illumination geometry that accompanies equinox lowers the sun's angle to the ringplane, significantly darkens the rings, and causes out-of-plane structures to look anomalously bright and cast shadows across the rings. These scenes are possible only during the few months before and after Saturn's equinox, which occurs only once in about 15 Earth years. Before and after equinox, Cassini's cameras have spotted not only the predictable shadows of some of Saturn's moons, but also the shadows of newly revealed vertical structures in the rings themselves. Prometheus is overexposed in this image. Bright specks in the image are background stars. This view looks toward the northern, unilluminated side of the rings from about 28 degrees above the ringplane. The image was taken in visible light with the Cassini spacecraft narrow-angle camera on July 30, 2009. The view was acquired at a distance of approximately 1.8 million kilometers (1.1 million miles) from Saturn and at a Sun-Saturn-spacecraft, or phase, angle of 97 degrees. Image scale is 10 kilometers (6 miles) per pixel.